Weak La Nina: The 2017-18 La Nina remains weak although likely maturing now as subsurface cool water to sustain La Nina is diminishing. According to multivariate ENSO index the current cold ENSO event ranks 20 from years 1950-2018 whereas 1 = the strongest La Nina and 69 = the strongest El Nino. During December the southern oscillation index was a very non-La Nina-like -0.26. 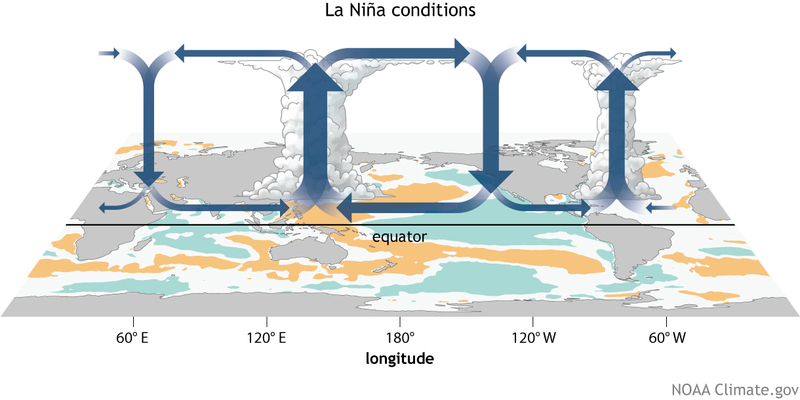 Typical La Nina climate during December usually features widespread wet weather in northern Brazil, the western tropical Pacific and east-southeast Africa. However, only east/southeast Africa was wet in December 2017 while northern portions of Australia and Brazil were unusually dry. The Ohio Valley was dry and exceptionally cold. One flaw in the evolution of La Nina later last year was the lack of cool inflow from the northeast (California Current) and anomalous cool surface water failed to develop in the Nino4 region (toward the Dateline). Most of the cool La Nina bias was located in the eastern half of the equatorial Pacific rather than the entire zone east of the Dateline therefore rendering the La Nina 2017-18 episode weak. Neutral Pacific decadal oscillation: During 2014-2017 the PDO was in a historic warm phase and a leading contributor to an amplified upper ridge pattern dominating western North America and fueling drought. The 3-to-4 year warm phase of PDO was uncharacteristic of the long-term cycle of PDO which transitioned to cool phase in the mid-to-late 1990’s. The long period of +PDO potentially indicated a possible change the long-term cycle. While PDO has been cool or warm extreme much of the past 6-7 years a neutral phase has developed the past several months and continues into 2018. Part of the problem preventing PDO transitioning to the cool phase which is typical given a La Nina presence is the persistent warmer than normal surface water southwest of California. Implied is a weak or non-existent northeast-to-southwest flow of cool water via the California Current toward the equatorial region. Instead the large mass of anomalous warmth has correlated to a persistent anomalous warm and dry upper ridge pattern affecting the Southwest U.S. the past 3-6 months. Presence of this upper ridge helped to enhance late season wildfires in California. Similar to the long-term phase change of PDO to the cool cycle in the mid-to-late 1990’s the North Atlantic initiated the long-term warm cycle of the Atlantic Multi-decadal Oscillation. Much of the past 20 years the North Atlantic sea surface temperature anomalies (SSTA) have been warmer than normal. The influence on climate has been increased incidence of U.S. drought and above normal number of hurricanes. Generally, the warm phase of both the AMO and Tropical North Atlantic (TNA) index tend to cool during the winter months. However, the intense +AMO and +TNA pattern of 2017 which helped fuel one of the strongest North Atlantic tropical cyclone seasons on record remains warm as mid-winter approaches. The anomalous warm North Atlantic has forced an upper ridge pattern inducing an equally amplified upstream trough in central North America. The Indian Ocean Dipole is in the neutral phase. Much of 2017 produced signs of the positive phase with cool SSTA northwest of Australia causing the drought that evolved in that nation last year. The neutral phase is dominant now. Recently, Australia set records for anomalous heat caused by a stronger than normal summertime subtropical ridge pattern. The upper ridge is amplified due to the connection between very warm surface water east of Australia and the influence on atmospheric temperature. The warm SSTA in this region will continue fueling additional historic heat concerns for eastern Australia this summer.